Consulting and implementation of the SAP components (such as FI, CO, AM, SD, MM, PP, PM, HCM) or rather migration to SAP ERP. Consulting and introduction of products: Financials, Supply Chain Management (SCM) and Customer Relationship Management (CRM). Support for introduction and development of complex integration processes with SAP Netweaver (SAP Web Application Server, SAP Portals, SAP XI/PI, SAP Mobile Infrastructure), construction and operation of your Business Intelligence Solutions (SAP Netwaever BW, SAP Business Object BI Product Portfolio). We focus on following solutions: SAP IS-Retail, SAP IS-Utilities, SAP IS-Telecommunications, Defense Forces Public Security (IS-DFPS). We support you in developing stand-alone solutions in the area of SAP products based on SAP Netweaver in complex technology architectures. 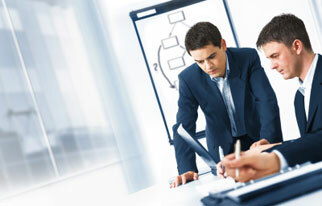 We also create support and operational concepts for you. We design and produce with you the latest E-Business and portal applications based on J2EE-compliant technology plattforms (as for example with the SAP Web Application Server). We realize with you modern EAI concepts and solutions based on the SAP Exchange Infrastructure (PI) with complex interface requirements.